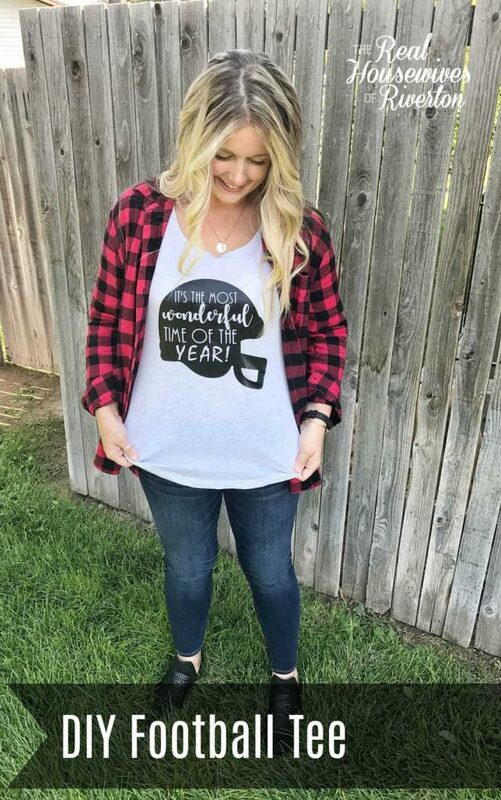 I loved making this DIY Football Tee with my Cricut Maker and am excited to share the cut file with you. 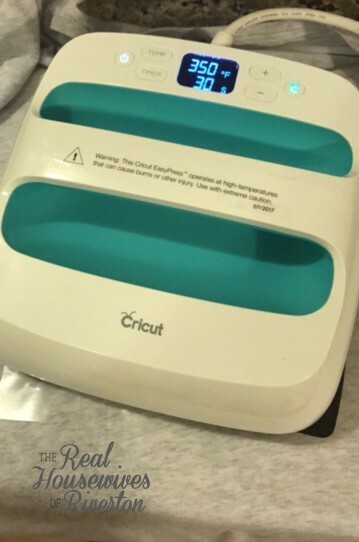 We love working with Cricut and everything we can create with these amazing machines. In case you’re new here I should probably take a moment to let you know it’s possible I have a slight football obsession. If I’m being completely honest I easily get sucked in to almost any sporting event but football, especially college football has to be my favorite. While I’m always cheering for the Utes, if they’re not playing I’m cheering against whoever is ranked above us! I’ve collected a variety of Utah apparel over the years, this year however I wanted something new, and something that shows my love for the sport regardless of who’s playing. 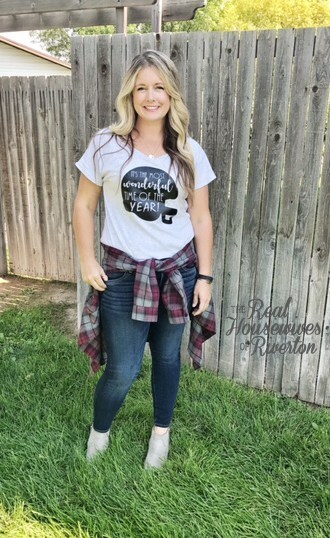 Enter my DIY Football Tee! 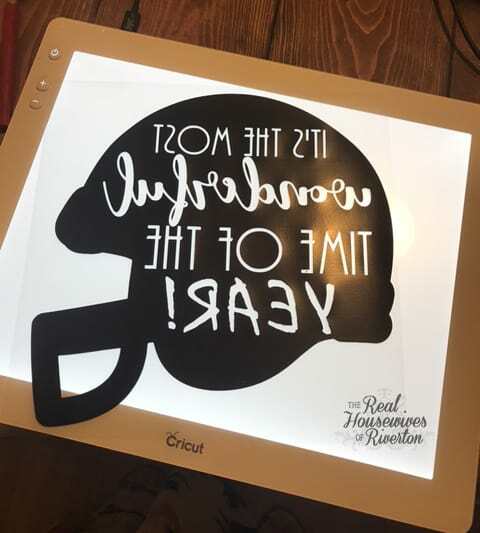 I stumbled upon this idea from a promoted photo on Instagram, I couldn’t find it again when I was looking for it so I had to break out my Cricut Maker and make my own. 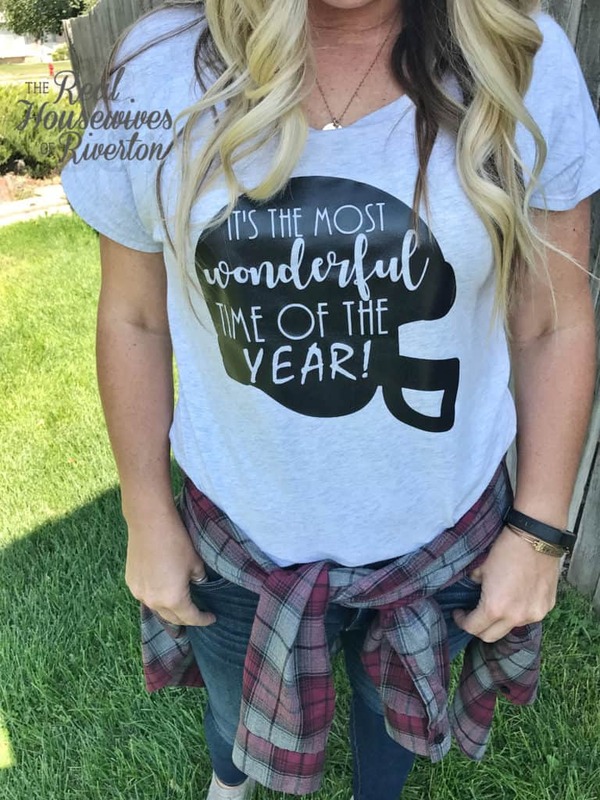 I’ve worn my shirt twice now and have gotten so many compliments, it’s possible that’s because it really is one of the most wonderful times of the year! Because both Utah and our local high school have black as one of their main colors I decided to cut my helmet out in black iron-on. The shirt is just neutral enough to match almost any team. I started by creating my design in Design Space. 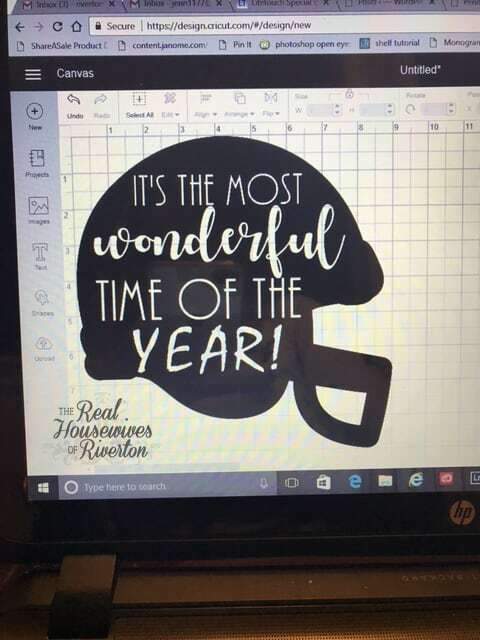 I found the helmet in Design Space and then used a combination of my own fonts and Cricut fonts to type out the words. I layered them onto the helmet and then using the slice tool removed them from the helmet so the letters would be the shirt material and not another iron-on color. If you want to make this shirt yourself (or even I was thinking this could make a fun blanket) I’ll include the link to the file in Design Space below. Before cutting make sure you’ve got your machine set to mirror the image so when you iron it on the words face the right direction. I want to mention real quick how much I love the Cricut BrightPad, I forgot to snap a photo before I finished my weeding but I love how the BrightPad makes seeing the lines so much easier when working with both vinyl and iron-on. Once the weeding is all done comes the very best part, applying the iron-on to the shirt. I use to have the most unnatural fear of this step, I was always afraid of ruining all my hard work but it’s true what they say, practice does make perfect…or at least a lot more confident because now I love it! 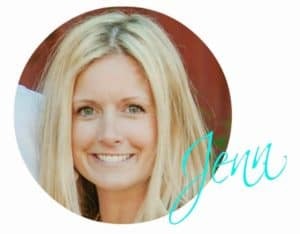 I recently received the Cricut Easy Press and it has been a game changer, I always felt like I had pretty good success with my iron-on and my trusty iron but with the Easy Press I know I’m going to end up with perfectly sealed images. It’s just the best! I still recommend washing inside out to protect your design but I am pretty sure that is standard for most shirts with any type of design on them. I love how my shirt turned out and I love how it looks with both school colors. 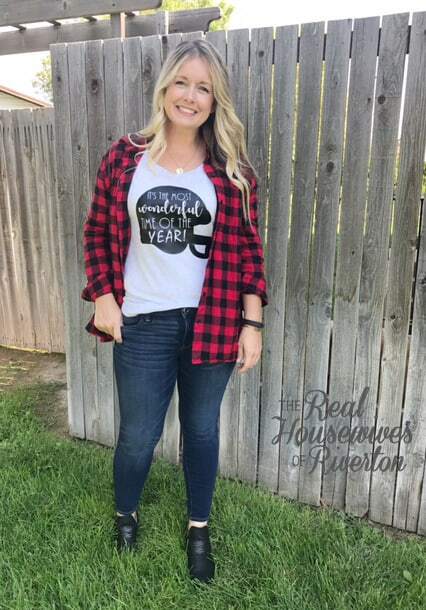 I also love that I can wear it any fall day and not just game day, that is if I can keep it out of my daughters’ closets long enough for me to get to wear it again. You should definitely make one, you’ll be really happy that you did…or at least I will be happy that you did! The family and I will be together tonight cheering on the Utes as they take on the Spartans. We’ll obviously be hoping for another mark in the win column but even if that doesn’t end up happening I am going to enjoying the fact that this cute family of mine enjoys watching the game almost as much as I do! Have an amazing Saturday and LET’S GO UTAH!!! !